Mediafly Mobile for the Palm Pre (WebOS) is similar to the popular Mediafly Mobile for iPhone, Android and BlackBerry. This version of the app allows you to watch and listen podcasts over WiFi or cell networks. 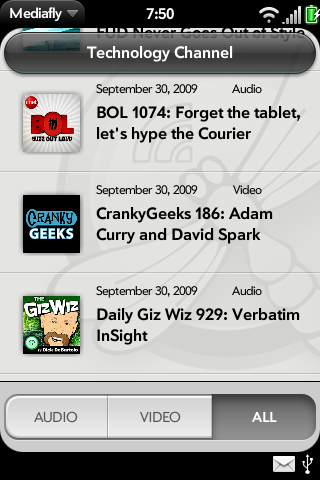 Out of the box the app provides a list of the most popular podcasts. These are organized into easy channels from Celebrity Gossip to News & Politics. You can then link the app to your free Mediafly.com account and then customize your own set of channels. Palm's WebOS will prove to be a very critical platform for Mediafly because of the compelling user interface coupled with the speed at which we can develop and launch new versions. So, try out the beta; good things to come from Mediafly on Palm's WebOS platform in the near future.